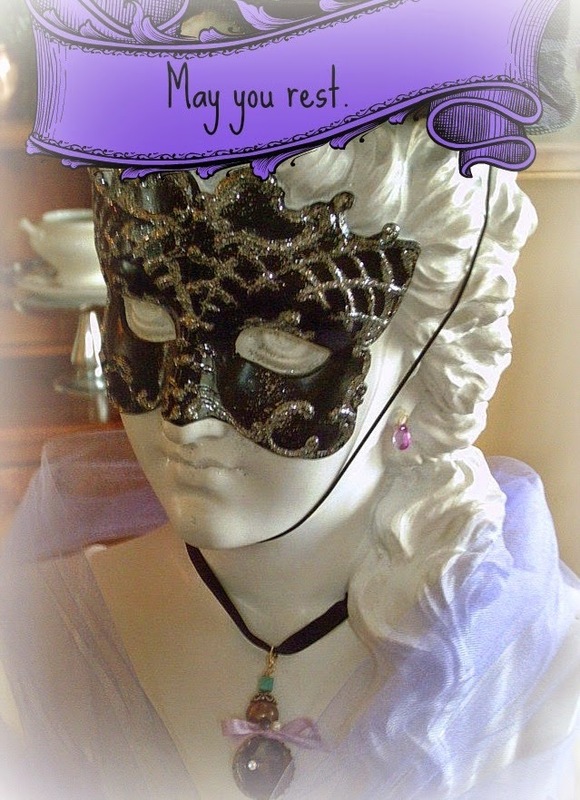 The lovely bust inspired this tablescape. Isn't she beautiful? Purchased from Home Goods this year. 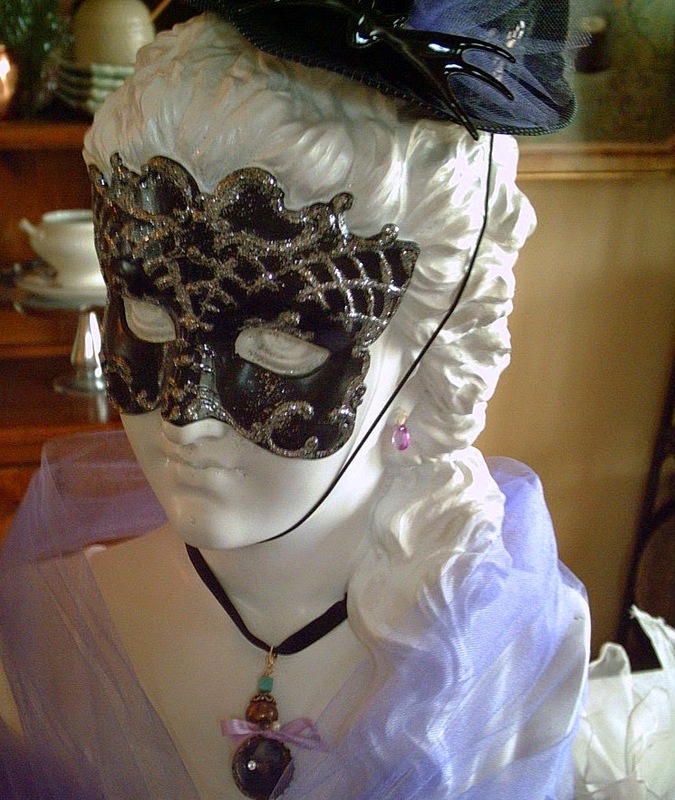 The glittered mask is molded onto her face. 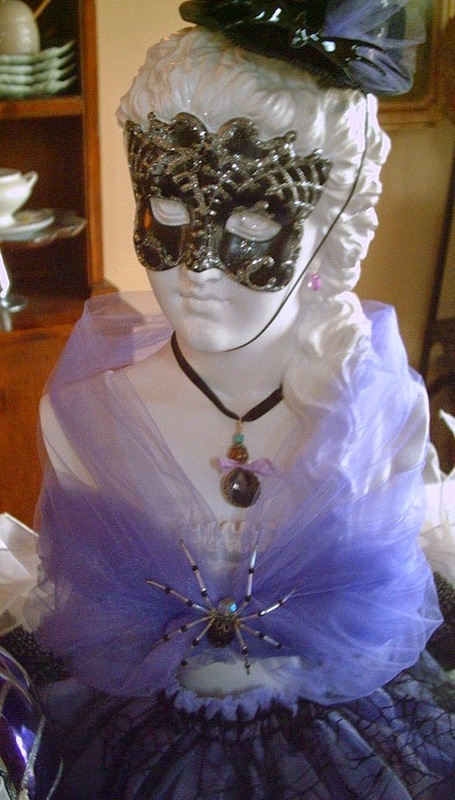 I have added earrings, the necklace, tulle shawl, spider brooch. On top of her head is a hat from Disneyland "Nightmare Before Christmas" with a little purple tulle added on. I think she will be invited to lots of parties! There are two styles of place settings. One a girl and one a boy. The "stack" is actually less than you would think! 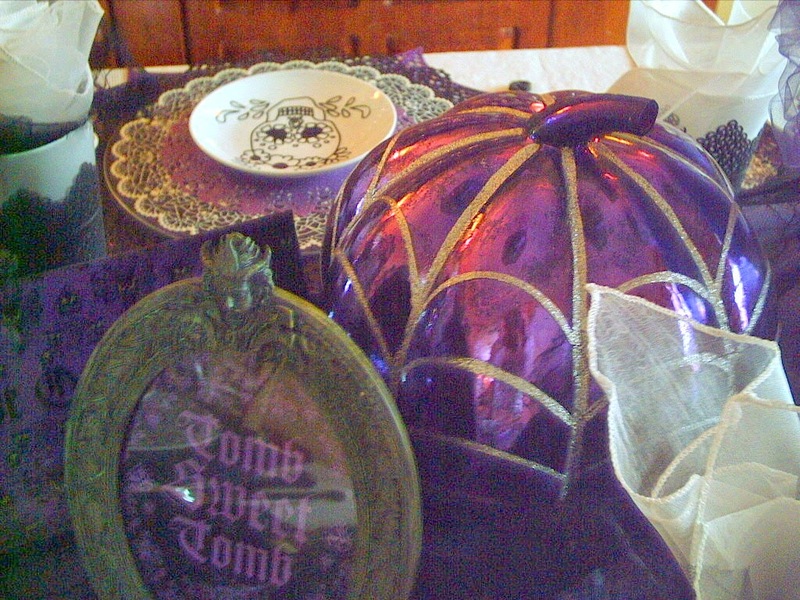 The purple place mat I love, love, love. Purchased from Kroger stores. They had them in silver, black, or purple. Even though made from vinyl there have a metallic finish, quite iredescent. On top of that I am using IKEA candle stands (which you need to go to their candle area). They were white and I sprayed them with a flat black paint. Next is a cake plate from Crate and Barrel. It has a black base with white kind of spooky lace overlay, which makes it look like 2 plates in one. Next from glitter scrapbook paper I made a doily with my Martha Stewart Crafts circle punch. So easy to do. You can use a square piece of paper and it will cut it round. 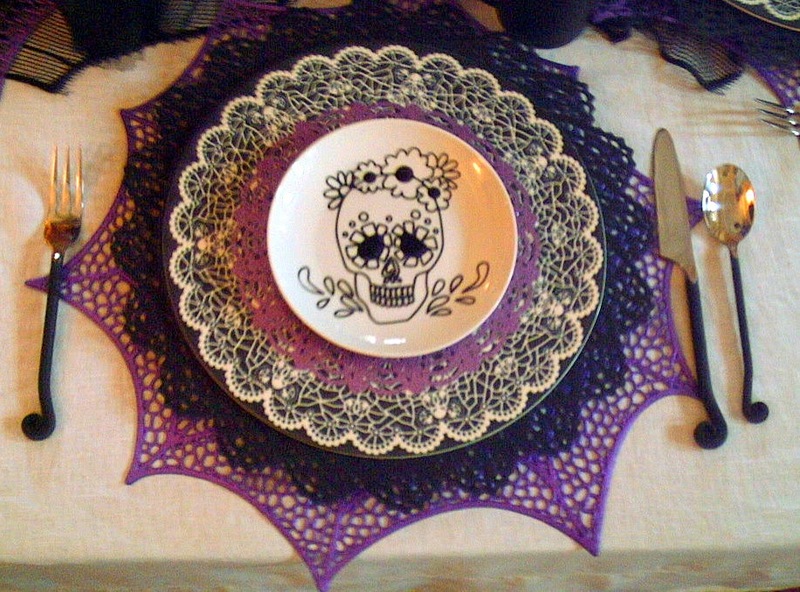 You can do from a 5" to about 12" doily. 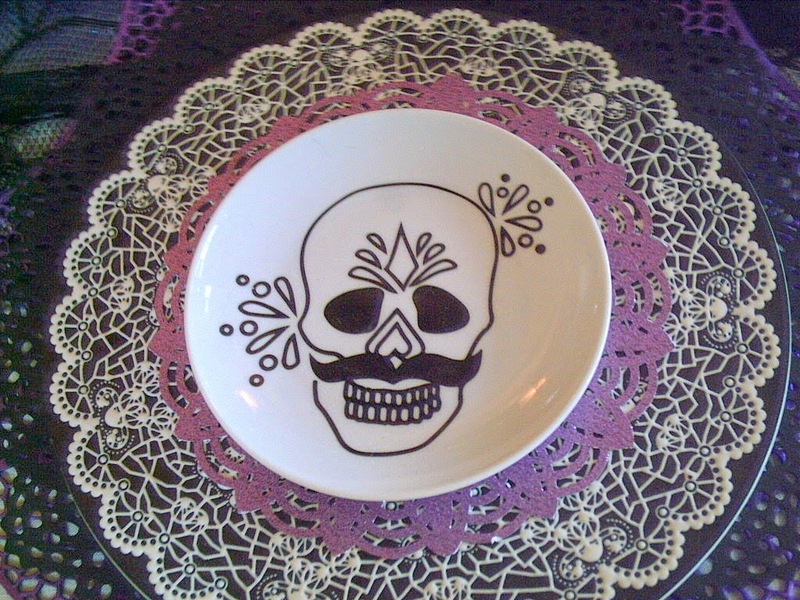 Then I have on top Crate and Barrel's Los Muertos plate. Flatware from World Market, which is so versatile. 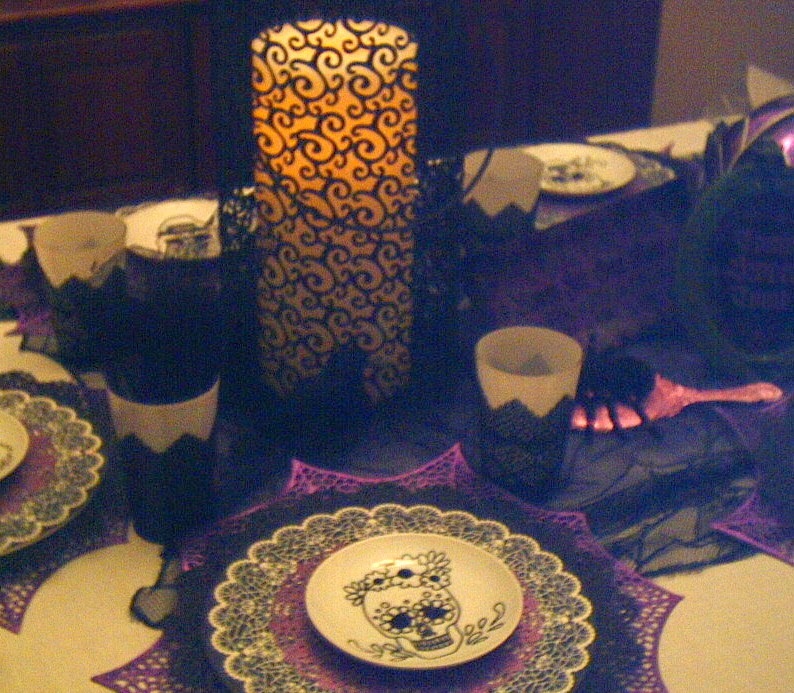 The boy version of this tablescape. He is cute, don't you think? Centerpiece is some purple tulle covered with a black spider web tablecloth. 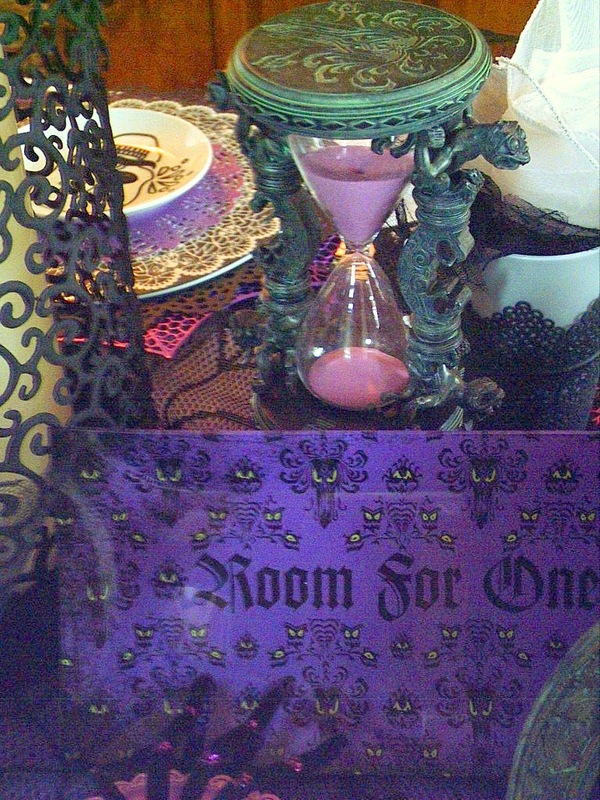 Tomb Sweet Tomb frame and Running Out of Time Hourglass, with Room For One More glass plate from Disney. Purple pumpkin from Home Goods. A little spider mirror in lavender, black, and purple rests upon the table. 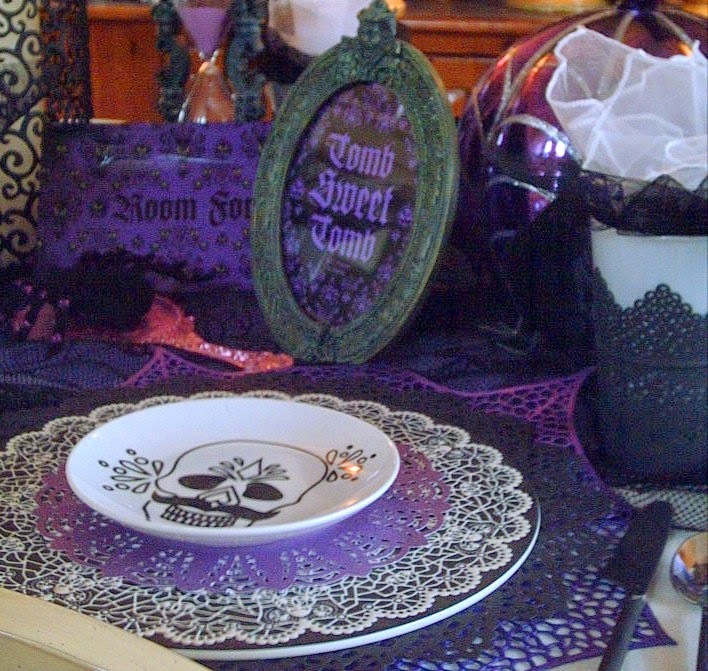 I bought this and a skull mirror (used in my "Talk Like A Pirate" tablescape) at a yearly festival called Swiss Days. 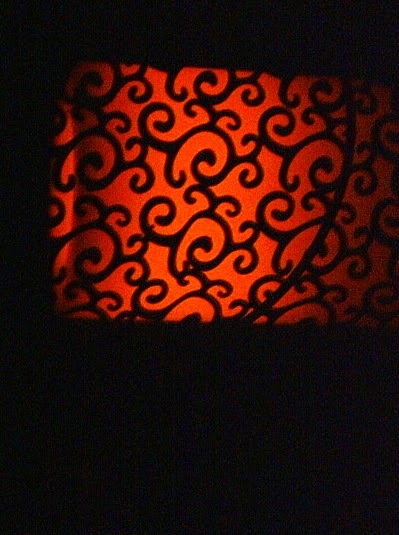 My lantern at night. Purchased at a Pottery Barn Outlet sale for five dollars. 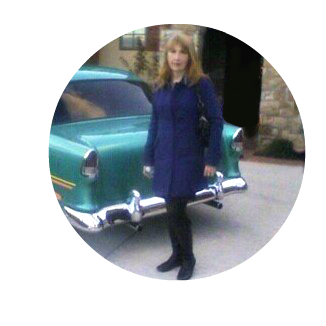 A Great Buy since they are ninety-nine dollars at the store. For this price I sprayed it black as well. 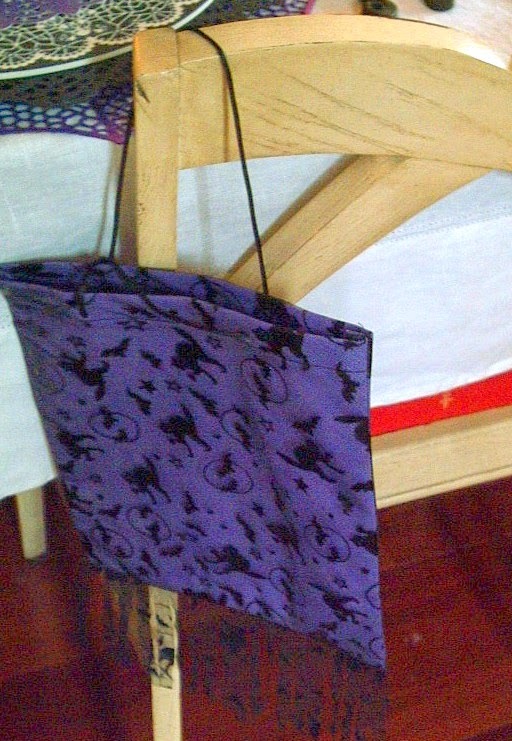 My party favor below is a satin and tulle bag I picked up at a drugstore sidewalk sale for a dollar. You can fill with goodies for your guests. I was able to purchase several in purple, green, or orange. 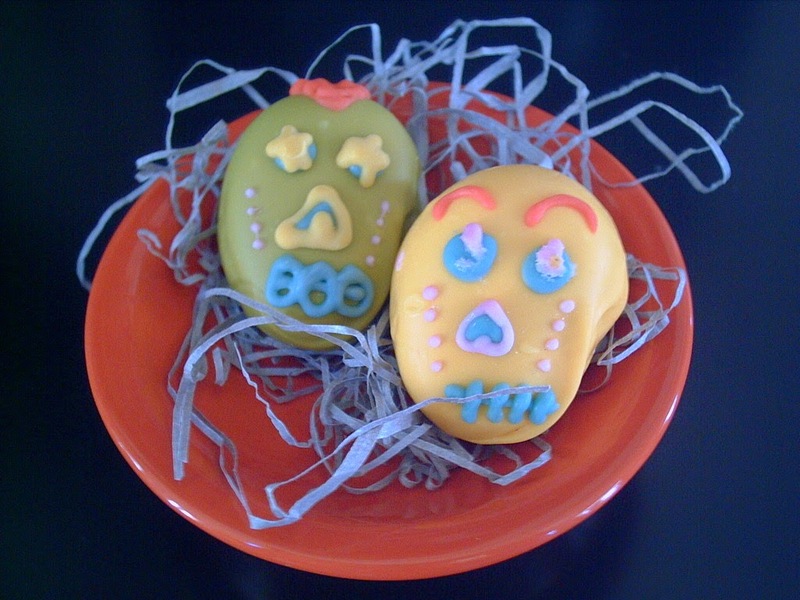 When it was time to leave I gave each guest some little take-home favors. A Day of the Dead white chocolate truffle shown on an orange cupcake pedestal. 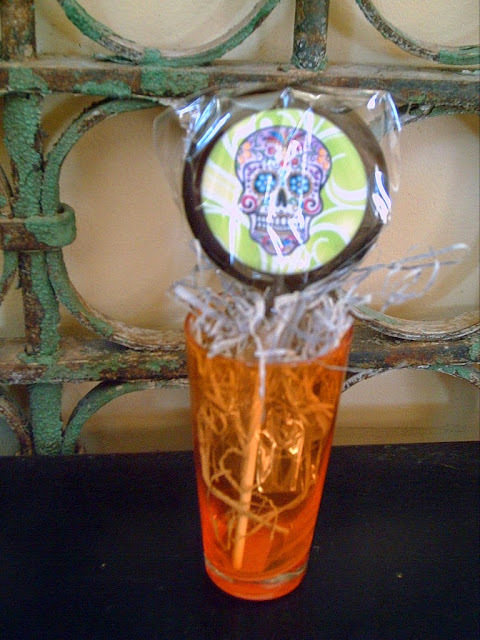 Also they received an orange double shot glass from Crate & Barrel with an adorable Day of the Dead Sucker from a candy company called Peppermint Place. Below is a closeup of the glass. 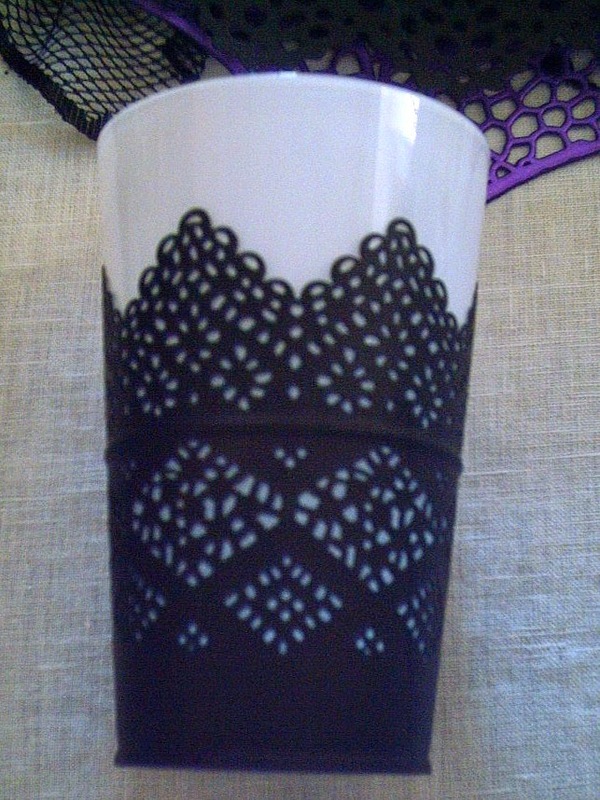 I used another candle holder from IKEA and spray painted it black and found a white glass there as well that fit perfectly inside. Thanks for looking. 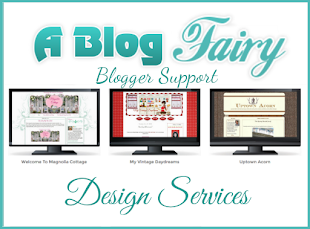 Feel free to leave a comment. 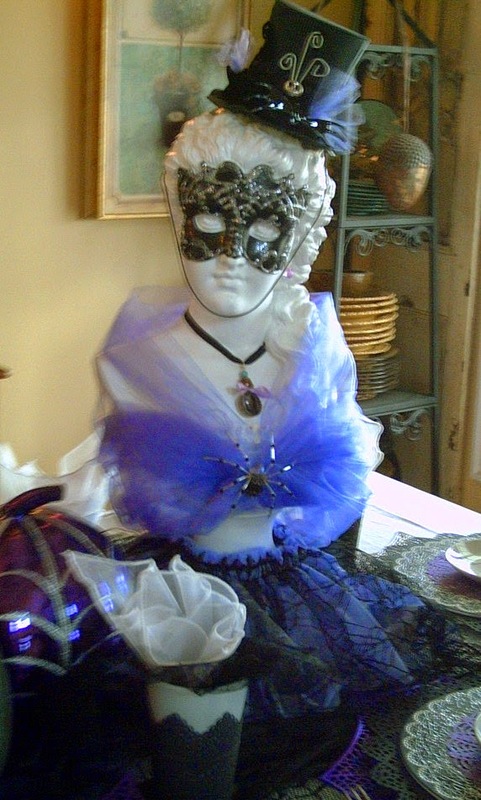 This would be a wonderful table for any masquerade.